The first developer preview of Android Oreo 8.0 was only out for a couple of days before Chainfire created a new root method for it. For the time being, only the Nexus 5X and Nexus 6P are supported by this first SuperSU ZIP, as the Pixel's dual-partition layout has created some hurdles, though Chainfire is surely working on overcoming those at some point soon. This root method is still in its earliest stages of development, so you should expect a few bugs here and there. Despite the lack of major visual changes in Android Oreo, behind-the-scenes tweaks have slightly changed the way rooting will work. SELinux rules have been tightened some more, and kernel changes have posed some problems. But, if you're a tinkerer and you're running Android 8.0 as your daily driver, then rooting your phone is a must, so we'll cover the process below. First up, you'll need to install TWRP. To do that, start by grabbing the newest IMG file from one of the following links, but make sure to download the right one for your device. From there, provided you've already unlocked your bootloader, just put your phone into bootloader mode, then plug it into your computer with a USB cable. Make sure you have ADB and Fastboot installed, then transfer the twrp.img file to the platform-tools folder inside of your ADB installation directory. From there, open a command prompt in the same directory, then type fastboot flash recovery twrp.img and hit enter. When you're done, go ahead and reboot your phone. If you need more help flashing the TWRP image with Fastboot, we've covered the process in detail at the following link. While the guide mainly deals with flashing factory images provided by the manufacturer, the same principles apply to flashing the TWRP image file. Now you'll need to download SuperSU on your Nexus 5X or 6P. The latest version of SuperSU takes care of a couple of bugs that managed to sneak into the first release of SuperSU for Android 8.0, so only one download is needed now. Big thanks to our own member Noah Alvarez for pointing this out to us. He's also gone ahead and tested this version of SuperSU with the latest/official release of Android Oreo, and it works there too! Next, reboot to TWRP by powering your phone off, then pressing and holding the volume down and power keys for five seconds. From there, press the volume down button twice to highlight the "Recovery Mode" option, then tap the power button to select it. 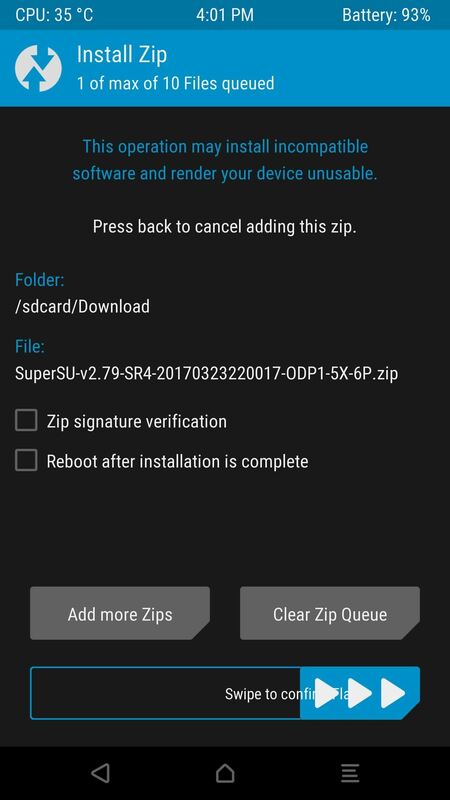 When TWRP boots up, tap "Install," then navigate to the Download folder and select the previously downloaded SuperSU ZIP. Then, swipe to confirm the installation, and when that's finished, tap on Reboot System and wait for Android to boot up (it might take a couple of minutes for the first boot with root). After your phone has turned back on, make sure SuperSU is in the app drawer. Be sure to let us know about your experience rooting Android Oreo, and remember that some root apps might be buggy until the developers are able to give them an update. Hey, thanks a lot for this guide, without it, I don't think I would be achieving root on OPP4. However, I am being slammed by a bug on my 6P where some apps don't see I have an SD card (internal) or aren't getting the permissions from it to display it. I've never come across anything like this, and i can't even download files from Chrome, so it's really getting in the way - wondering if you/anyone has a potential solution.. This is happening when flashing the SR4 image directly through 3.1.1.0 TWRP, I'm trying the ExtraDelay version right now, I will report back if it is different. That's awesome news! Thanks so much for sharing that find with us, I'll update the article to link to the latest version of SuperSU so other readers don't experience the same issue. Hey, wanted to let you know that I've updated the article. Take a look at it when you have the chance, there's a surprise hidden in there for you. I have a Nexus 5X and android Oreo on my device. I have attempted it twice with the same result. SuperSU beta installations can be finicky at times, I've experienced that issue myself before... The fix, for me at least, was to flash a different version of SuperSU. Could you try the latest SuperSU beta? If that doesn't work, the current stable version might do the trick. I first tried with the current stable version, several times, always ending at failure, abortion. Same result. 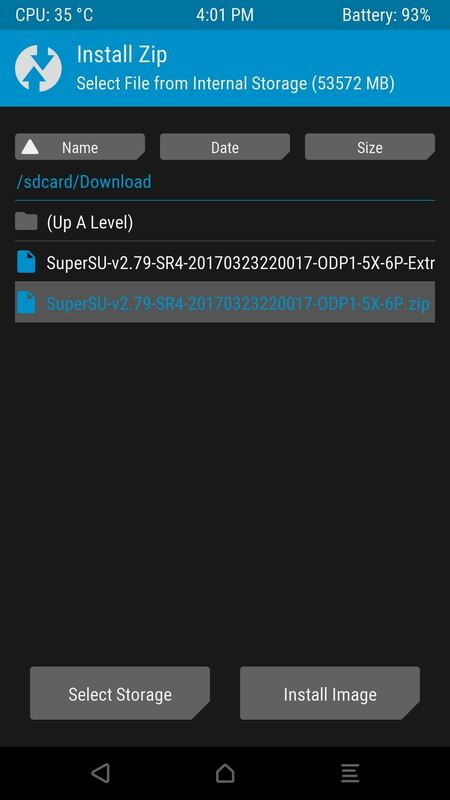 Then, I have tried with the beta version, which at last has got to instal the Super SU app on my device, however, the phone is still not root. 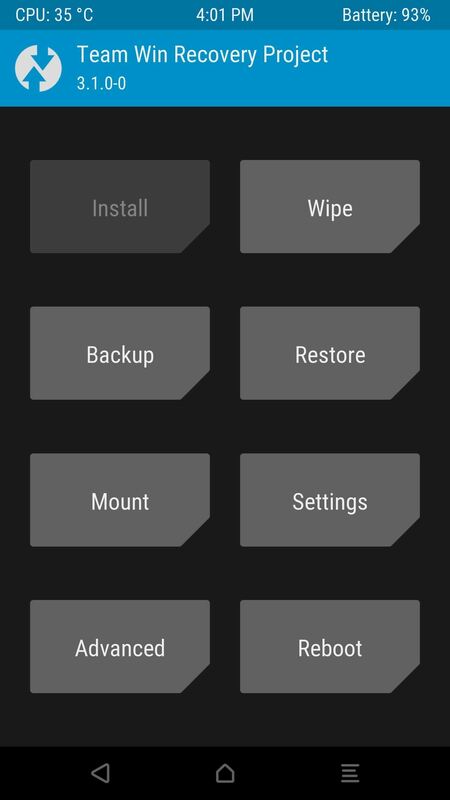 Nexus 6P is stuck at "Google" when attempted Recovery Mode after flashing twrp.img ... Does it take a long time or is something wrong? Also, can I copy SuperSU.zip after the Recovery Mode appears?